BLAIR PEACH RIP – STU WHO? 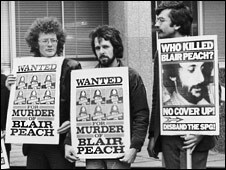 New Zealand-born Blair Peach was working as a special needs teacher in the east London borough of Tower Hamlets when he was killed on 23 April 1979. He had gained prominence as an anti-racism campaigner when leading a successful campaign to close a National Front building in the middle of the Bangladeshi community around east London’s Brick Lane. And it was during another protest against the extreme right-wing group that he was to lose his life. Mr Peach, 33, joined members of the Anti-Nazi League in demonstrating outside Southall town hall, where the National Front was holding a St George’s Day election rally. The area was home to one of the country’s biggest Asian communities and Mr Peach was among hundreds caught up when trouble flared. Protesters had arrived to be met by rows of police officers who had sealed off the much of the area. More than 40 people, including 21 police, were injured and 300 were arrested. Bricks and bottles were hurled at police, who at the time described the rioting as the most violent they had handled in London. Mr Peach died in hospital, having collapsed with fatal head injuries in a side street 100 yards from the town hall. Witnesses claimed to have seen him being hit over the head by members of the Metropolitan Police’s Special Patrol Group (SPG). Some 84 people were called to give evidence at the subsequent inquest, including 40 SPG officers implicated in the incident. Eleven witnesses said in evidence that they had seen Mr Peach being struck by police. One protester, Martin Gerrald, told the inquest: “Mr Peach was hit twice in the head with police truncheons and left unconscious. The jury also heard how crowbars, sledgehammers and coshes had been found in lockers of SPG members. However, none of the officers admitted hitting Mr Peach. The coroner also refused to allow details of an internal Scotland Yard investigation into the death to be admitted as evidence. The jury returned a verdict of “death by misadventure”. Mr Peach’s family felt sure the Met investigation, conducted by a team of 30 detectives under Commander John Cass in the force’s Complaints Investigation Bureau, held the key to the truth behind his death. At the time, the government refused requests to debate the matter in Parliament and calls from 79 MPs for a public inquiry. No officers were ever charged with the attack, although the Met reached an out-of-court settlement with Mr Peach’s brother in 1989 after the family gained access to part of the internal report which named six officers. Another 10 years on, the Labour government ruled out an inquiry into Mr Peach’s death, saying too much time had passed for any new light to be shed on the circumstances. However, Mr Peach’s girlfriend of eight years – Brighton woman Celia Stubbs, now 68 – continued to press for the release of more evidence – and the police’s internal report was finally released in April 2010. That report concluded that an officer had struck the fatal blow – but there had been a cover-up so it was impossible to work out who had been responsible.